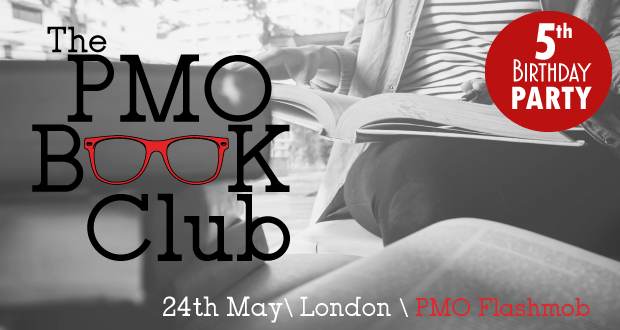 PMO Book Club Event, London. What is the PMO Book Club Night all about? On the 24th May, the PMO Flashmob will be celebrating their fifth birthday. For those of you who may not be familiar with them, PMO Flashmob are a networking and community group for the PMO Profession. They run social meetups and Mini-masterclass events. I've been attending their events from the early days and it has been a pleasure to see the PMO Flashmob, and the PMO Practitioners who attend prosper and grow. PMO Flashmob organize events in England and Scotland and have recently expanded into Australia. To celebrate their fifth birthday, the PMO Flashmob are holding a PMO Book Club night. Throughout the evening people will be invited to stand up and share concepts and ideas they have got from books, websites and whitepapers that they think would be of benefit to the wider PMO community. As I understand it, the standing up and talking bit is not compulsory - it is perfectly acceptable to simply turn up and mingle. However, I'd encourage you to stand up and give it a go - especially if you do not usually have the opportunity to stand up and present in front of a crowd. Events run by PMO Flashmob are typically friendly and inclusive. You'll be among friends who will be eager to hear learn from your experiences and from your book recommendations.